The Kresge Foundation will support 21 community development organizations across the city of Detroit with $1 million in annual grants announced today for the next three years. “Groups on the frontlines of the city’s revitalization told us that operating support for their day-to-day operations is the most important contribution we can make to support their work,” says Wendy Lewis Jackson, managing director of Kresge’s Detroit Program. The three-year grants range from $30,000 to $60,000 per year depending on the size of the organizations. Many of the organizations have received Kresge funding for projects in the past, particularly through the Kresge Innovative Projects: Detroit pilot initiative. But project funding does not cover necessary staff and overhead expenses that are essential for community development organizations to be effective. “There was a definite need to add this to our efforts to further revitalization in city neighborhoods,” says Kresge Detroit Program Officer Bryan Hogle. The organizations vary widely in their size and histories. One of the best-known, Focus: HOPE, was founded in 1968 in response to the previous year’s Detroit rebellion. Its food, workforce development and education programs operate across metro Detroit, while its community development work is aimed at the renewal of 100 blocks surrounding its headquarters in the HOPE Village at Oakman and Linwood on Detroit’s westside. Focus: HOPE has more than 200 employees total; the organization’s community development work, which has a dozen staffers, will specifically receive a boost from the Detroit Program’s new operating support grant. In contrast, there’s GenesisHope Community Development Corp. in the Islandview Village neighborhood of the lower eastside. GenesisHope was formed in 2009 by members of Genesis Lutheran Church in the community the church has served for more than 35 years. GenesisHope has the equivalent of two fulltime staff members working on youth engagement, and community and economic development. That development work includes strategies to manage vacant land and develop open spaces. GenesisHope projects have ranged from a pop-up farmers market to creation of a rain garden and bioswale to fight the flooding to which the neighborhood is prone. Kresge’s operating support grant will allow GenesisHOPE to maintain its current staffing, and devote more time and resources to engaging the community, says the group’s executive director, Jeanine Hatcher. She also hopes that the group will be able to leverage Kresge’s support for additional funding from other sources. “The multiyear funding will have a significant impact on our organization,” Hatcher says. “Each of these groups understands the significant strengths of their neighborhoods and how those strengths can be brought to bear on neighborhood challenges,” says Hogle. The community development organizations receiving the grants are: Bridging Communities, Central Detroit Christian CDC, Cody Rouge Community Action Alliance CDC, Congress of Communities, Detroit Catholic Pastoral Alliance, Detroit Hispanic Development Corporation, Eastside Community Network, Focus: HOPE, GenesisHOPE CDC, Grandmont Rosedale Development Corporation, Joy-Southfield CDC, LifeBUILDERS, Mack Avenue Community Church CDC, Osborn Neighborhood Alliance, Southwest Detroit Business Association Inc., Southwest Housing Solutions, The Brightmoor Alliance, The Villages of Detroit, U SNAP BAC, Urban Neighborhood Initiatives Inc., Woodbridge Neighborhood Development Corporation. Sherita Smith (center), executive director of the Grandmont Rosedale Development Corporation, stands in front of the Grand River WorkPlace with staff members (from left) Kathy Garrett, communications manager, Chelsea Neblett, community development manager; Tom Ridgway, project manager; Dorothy Holmes, bookkeeper; and Ashley Baker, economic development specialist. Grandmont Rosdale was one of 21 recent recipients of Kresge’s community development organization operating support grants. The Grand River WorkPlace in Northwest Detroit is the development corporation’s co-working facility and small business incubator that offers flexible, affordable office space for small businesses and independent workers. Ezekiel Harris is the executive director for the development arm of Mack Avenue Community Church. He stands in the upstairs at 7900 Mack Ave., which is being redeveloped to house a coffee shop, laundromat, a youth literacy program and a community legal clinic. Mack Avenue Community Church's community development operation recently received one of 21 Kresge Foundation's operating support grants for community development organization. The group operates in the Pingree Park neighborhood on Detroit’s eastside. Quincy Jones, of the Osborn Neighborhood Alliance, stands in basement of the Matrix Center that has been converted into an art space for youth in the Osborn neighborhood of Detroit. 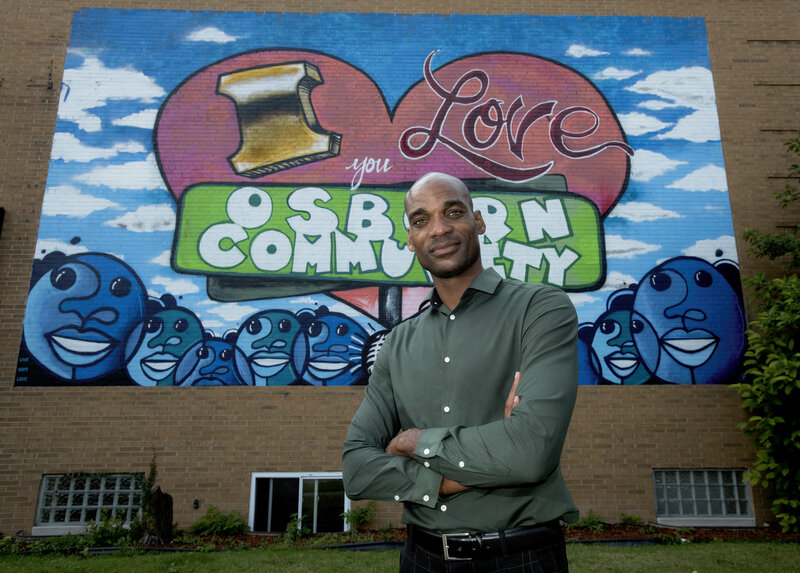 The Osborn Neighborhood Alliance, which works in the neighborhood of its name in Northeast Detroit, recently received one of 21 Kresge Foundation's operating support grants for community development organization.